Close your eyes. Imagine a place where the room, the street (the city!) is food obsessed, and you are no longer the sole person planning what to eat for dinner whilst tucking into lunch, or annoying your fellow diner who can’t touch their plate as you get snap-happy hashtagging your meal. What if we told you this place actually exists? For 17 days from 10–26 August you’ll finally find your tribe during Visa Wellington On a Plate, NZ’s largest and tastiest food festival. 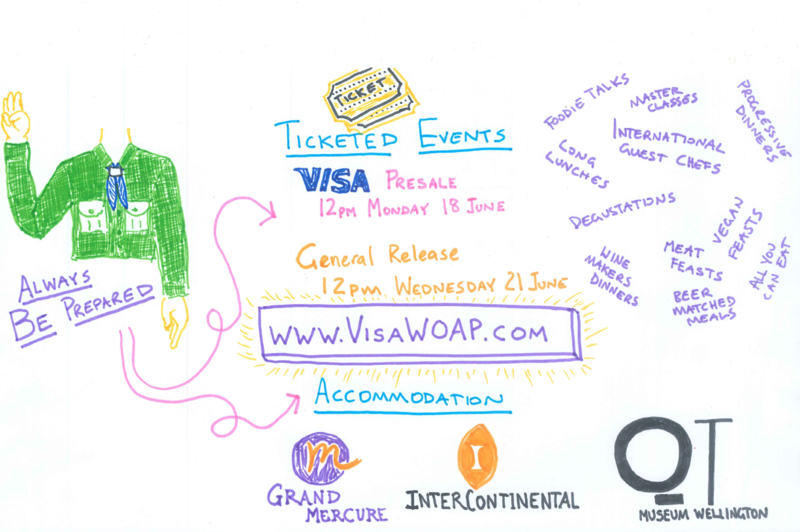 Visa WOAP (as it’s known to seasoned attendees) is having an extra special year, as it celebrates its 10th birthday – they’re having quite the party and your invited! Although all the fun starts August 10, there are some parts of the festival you need to start thinking about now! Events are the showpiece of the festival – one-off-experiences that you will talk about for years to come. Plan your trip/budget/flat outing around at least one event, I promise you won’t regret it. From learning from pros, sitting down to feasts, or going all out on multi-course dinners, don’t you want the opportunity to drop the word “degustation” in a conversation just this once? If you’re coming from out of town, you’ll be joining fanatic foodies from around the country and afar to take part in this food frenzy festival. We’ve got you sorted with great accommodation partners, with exclusive offers – check them out. When there’s hundreds of burgers, menus and cocktails and only 51 meal times across the 17 days available, (if you’re local or having an extended holiday and also not including second breakfast) you have to be strategic. Don’t forget to share them with your friends – even though you may not be the shared plates type of person – food always tastes better with friends. From fried chicken or edible souvenirs to desert island desserts, pop ups are perfect for filling in the gaps, for when you find yourself in town after work, before another event or taking a break from shopping at David Jones. Pop ups are free entry, you just pay for what you eat and drink. Always fun and lively, they’re a great entry point to the festival. A bit like Pokémon GO, spot the groups of people roaming the streets, travelling great distances in search of capturing the best burger. The most popular part of the festival, Burger Wellington is where hundreds of participating eateries submit a unique, weird, unusual but always delicious burger offer (often with a special Garage Project beer match) to try and claim the burger crown (more on that soon). With 180 this year, you could say it would be impossible to try them all, but trust us, there will be people who will give it one hell of a go. Gotta’ catch em’ all! Not much for burgers and beers, or just love to sip on a spirit-infused soda? Wellington’s mixologists (fancy, but much deserved title for bartenders) create special one-off cocktails, matched to small tapas treats. These tipples are ridiculously good and you could easily have a night off multi-course dining and instead go multi-bar hopping (all cocktails have a mocktail alternative, so you can consume responsibly). The chefs from each eatery submit a Festival Dish course, inspired by the theme (2018’s is, of course, ‘Party”!). This is where they have a bit of fun, experiment with ingredients and techniques and showcase local produce. You can get the festival dishes at either lunch or dinner – but if you’re a bargain hunter, go full throttle at dinner with a Dine Wellington menu. They’re multiple course set menus, at very reasonable prices. Last but not least, after eating all those burgers, cocktails and festival dishes, jump onto your account on VisaWOAP.com and rate them out of 10 – as they’re all entered into the Festival Awards competition where we crown the best following the end of Visa WOAP, and your ratings determine the finalists. Tried a few burgers and think one deserves to have a higher rating than you initially decreed? Don’t worry! You can amend your ratings any time until ratings close, midnight 26 Aug, PLUS each rating is an entry to be in to win sweet prizes.